The Hawksworth Young Chef Scholarship competition, now in its seventh year, is excited to announce that applications for the 2019 competition are officially open, kicking off Canada’s largest search to find the future stars of the culinary scene. Established in 2013, the Foundation looks forward to continuing its work encouraging aspiring young chefs from across the country by giving them the opportunity to showcase their cooking skills in front of an esteemed panel of chefs and critics. The lucky competition winner will take home the grand prize of $10,000 and a placement at one of the top restaurants in the world – giving them the inspiration and opportunity needed to develop their professional skills. Regional heats will be held in Calgary, Vancouver, Montreal and Toronto throughout May. The Scholarship’s founder and owner of Hawksworth Restaurant, Nightingale and Bel Café, Chef David Hawksworth, will be joined by leading chefs from across Canada. Past judges for the competition have included Chef Normand Laprise of Toqué and Brasserie T, Chef Marc-André Royal of Le St-Urbain and La Bête à Pain, Chef Chris Stewart of Donnelly Group, Chef Grant van Gameren of Bar Raval, Bar Isabel, Rosalinda and Quetzal, Chef Luciano Monosilio of Pipero Roma (1-Michelin Star) and Chef Mark McEwan of The McEwan Group. In each regional heat, 10 selected candidates will compete against each other – and the clock – to create a main course dish for four using only specified pantry ingredients within the 90 minutes given. The top two from each heat will advance to the final event, where each candidate is allotted three hours to prepare and plate four identical main course dishes and four identical dessert dishes using the selection of surprise Black Box ingredients and common pantry items. 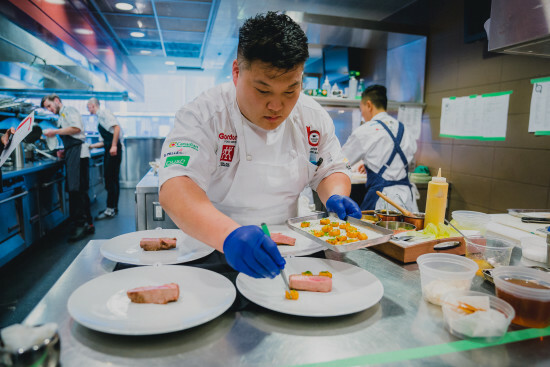 The ultimate prize will be awarded to the young Canadian chef who displays the drive, passion, skill and professionalism to succeed as judged by the panel of industry professionals. Following last year’s Toronto finals, this year’s final event will be held in Vancouver in October when one deserving chef will take home the grand prize of $10,000, an international cooking stage, a range of sponsor gifts and the bragging rights to being named Canada’s most talented young chef. Deadline for applications is Monday, March 11, 2019.